A Clamato-based bath of tender crabmeat and monkfish chunks. The most terrifying movie about the beach, and the worst pr campaign for great white sharks ever conceived, Jaws’s titular (and very hungry) underwater beast may have been mechanical, but he was no less menacing. Characters in the movie fled the water, and so too would the legions of kids who saw it on the big screen and were promptly traumatized. Our seafood cocktail, a spiced Clamato-based bath swimming with monkfish chunks, pays homage to his bloodthirsty ways and the means by which they tried to catch him—by chumming the waters. Preheat oven to 425°F. Place monkfish on a foil-lined baking pan. Drizzle with 1 Tbsp oil and sprinkle with paprika, salt, and pepper. Roast, without turning, until just cooked through, 10 to 15 minutes. Cool to room temperature. Cut into bite-sized chunks. Stir together remaining 3 Tbsp oil, Clamato, onion, lime juice, ketchup, cilantro, garlic, and Tabasco. Gently stir in fish and crabmeat. Serve well chilled. A journey is unique in its ability to inspire extraordinary discoveries, art, stories, and also food. 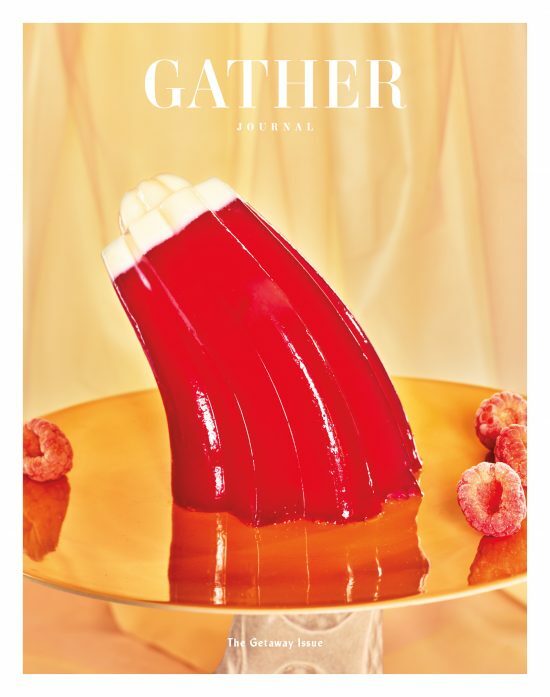 Now, as the need to get away from it all, if only for the duration of a meal, feels more urgent than ever, the summer 2018 Getaway edition of Gather explores the many shapes that an escape might take. Sign up to get updates about new releases and party invites. Winner of a James Beard Award, an Art Director’s Club Award and twelve Society of Publication Designers Medals - including 2015 Brand of the Year.